Deadline for grant requests is August 15th! Police and Fire Departments still have time to submit theirs for the 2013-14 NFL season to The Ben Roethlisberger Foundation! This marks the seventh grant cycle for the Ben Roethlisberger Foundation. The majority of the grants distributed will help K-9 units to purchase dogs and dog safety vests, but other types of needs are also considered. The Foundation will be distributing grants in the cities and surrounding communities of each regular season away game for the Steelers during the 2013-14 season. The Ben Roethlisberger Foundation invites police and fire departments in these eight cities to submit proposals detailing their needs. Also, for each Steelers’ playoff game, a grant will be awarded to a city anywhere in the United States that would not otherwise be eligible to apply. In addition, the Foundation will continue to make grants to several police and fire department K-9 units in the Pittsburgh area following Super Bowl XLVIII. As part of the NFL International Series, the Pittsburgh Steelers are set to meet the Minnesota Vikings on the turf of Wembley Stadium in London on September 29, 2013. The Ben Roethlisberger Foundation will mark the inaugural occasion of the Steelers playing a regular-season game overseas with its first international grant to support law enforcement in the London area. The Foundation distributed more than $135,000 in grants to K-9 units around the country during the 2012 NFL season and has distributed in excess of $950,000 since 2007. Eligible departments must apply to The Giving Back Fund by August 15, 2013. You can view the full grant requirements, eligibility and evaluation process, please visit http://www.givingback.org/documents/RFP_2013_BRF_app.pdf. Photo: That’s Shadow, he was purchased with a grant from The Ben Roethlisberger Foundation. 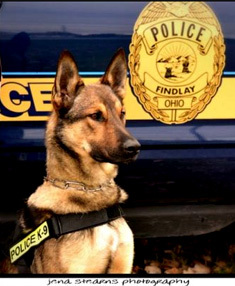 Shadow joined the Findlay Ohio Police Department last year as its drug-detecting canine. Shadow and his handler, Officer Chad McMonigal, inspect vehicles for illegal drugs, and meet citizens in an effort to prevent crime. You can also see the guidelines on Ben’s Foundation page here. Hey fans! Looking for a fun and active way to support the Ben Roethlisberger Foundation? You can – by participating in the one running event that will allow you to experience the best of a Pittsburgh in less than 5K? Registration is now open for this race on October 12, 2013 at 10:00 am! People from Pittsburgh and around the country will be able to participate in events that showcase what makes the city great. 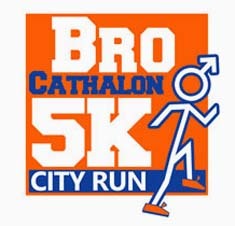 Bro Council, recently voted “Best Website” by readers of Pittsburgh Magazine, is excited to bring to life the city’s very first Brocathalon. With this event, Bro Council will be incorporating challenges that highlight the city’s best food and cherished icons. Plus, former Steelers Jeff Hartings and Justin Hartwig will emcee the event and greet runners at the finish line for a post-race party featuring the best food and fun from the City of Champions. You know what else? You’re also helping out two great causes as a portion of the proceeds from the Brocathalon will be donated to locally founded charities, including the Ben Roethlisberger Foundation and Urban Impact Foundation. Ben also has his own coupon code for you to use for a discount. If you register with the code “bigben7” you’ll receive $3 off your registration fee! This just isn’t any race….while you run, you’ll be dodging potholes, painting pop art for charity, being chased by zombies, eating chicken wings – and more!